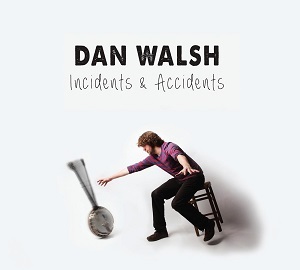 There are lots of acoustic folk albums around but most tend to use the acoustic guitar as the main instrument along with instruments such as the fiddle, so Dan Walsh differs significantly as his album is based around the Banjo. Right from the start it gives the album a distinctive sound. Given his use of the banjo it won't surprise you to learn that as well as Irish/Scottish folk influences, he's also influenced by Bluegrass - a natural music to influence a banjo player. What is more surprising is the Indian influence - check out the video for "Whiplash reel" below and that Indian sound comes through clearly. It's remarkable how well he manages to replicate the sounds of the Indian instruments using just a banjo - I'm sure that was not an easy thing to learn. While the music is almost all Banjo playing, there are some guests who contribute music on the fiddle, percussion and the mandolin, but these are used quite sparingly. The album features eleven tracks - seven songs and four instrumentals, and it's testament to the talent of Dan Walsh that I enjoyed the instrumentals just as much as the songs featuring vocals. Generally I find instrumentals less interesting - more "background music", but there's something special about the amazing banjo playing featured here that keeps the listener's attention. With the album being mainly banjo and vocals it has a very stripped-back style but that apparent simplicity means that you focus more on the intricate playing and the vocals - with a 5 or 6 piece band the sounds of the various instruments tend to drown each other out at times so you focus more on the overall sound and don't get to hear some of the detail that is being played. This is a great album - definitely well worth a listen.